Arsenal midfielder Alex Oxlade-Chamberlain will miss "six to eight weeks" but does not need an operation, says Gunners boss Arsene Wenger. The England international, 22, injured his knee in the Champions League loss to Barcelona on 23 February. 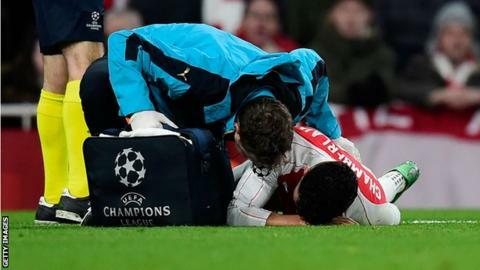 He left Emirates Stadium on crutches after the 2-0 first-leg defeat. Arsenal host Swansea in the Premier League on Wednesday. They are third in the table, three points off Tottenham and five behind leaders Leicester. What else did Wenger say? The Frenchman called criticism of his Arsenal team as "excessive" following their 3-2 defeat to Manchester United at Old Trafford on Sunday. Former Liverpool manager Graeme Souness, now a television pundit, called the Gunners "weak and insipid". "I'm never surprised by the criticism that comes," said Wenger. "Part of the opinion is always a bit excessive and emotional, but we have to deal with that and I don't complain about it. "I think people are a bit too emotional and we want to put things into perspective by analysing things a bit more in a neutral way."